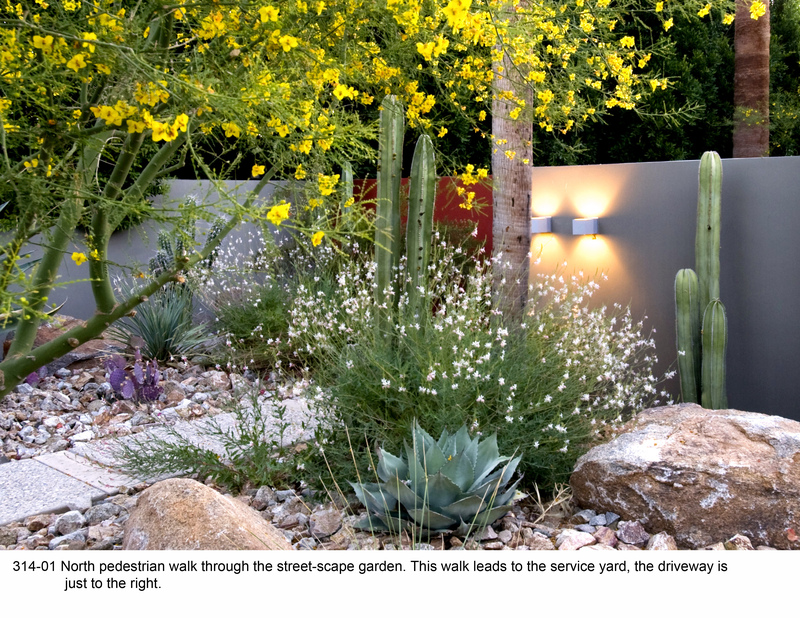 North pedestrian walk through the street-scape garden. This walk leads to the service yard, the driveway is just to the right. 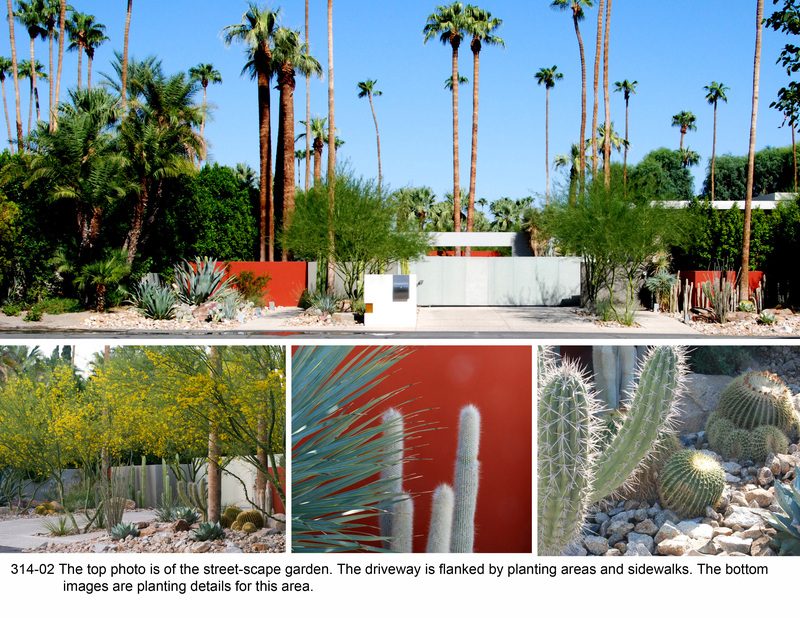 The top photo is of the street-scape garden. The driveway is flanked by planting areas and sidewalks. The bottom images are planting details for this area. 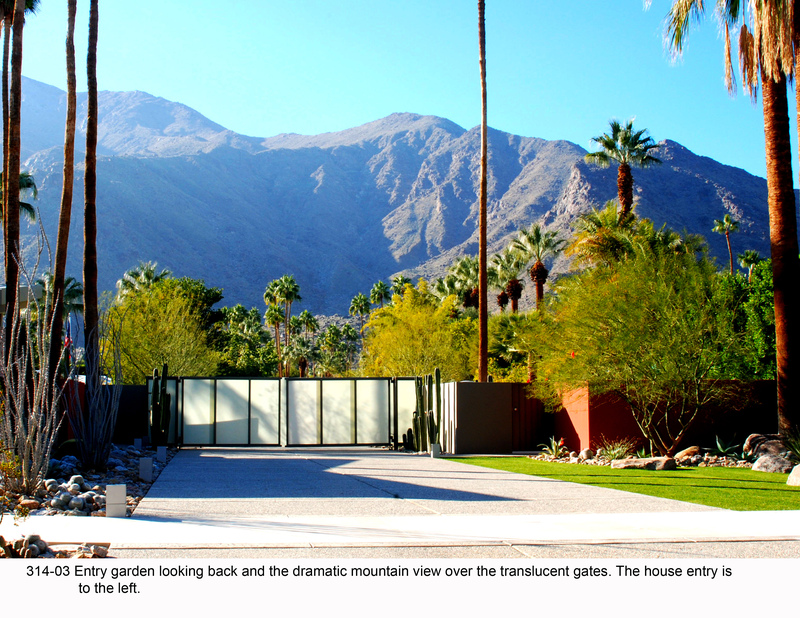 Entry garden looking back and the dramatic mountain view over the translucent gates. The house entry is to the left. 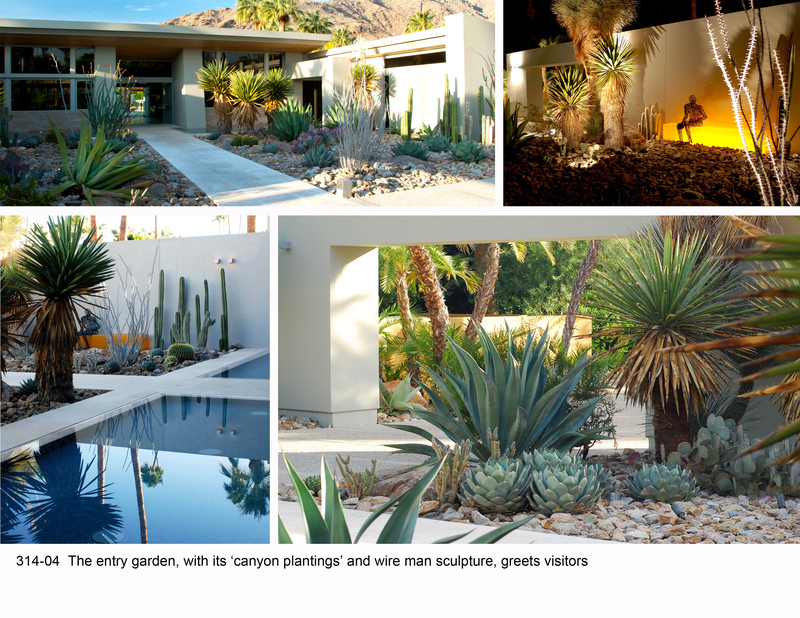 The entry garden, with its ‘canyon plantings’ and wire man sculpture, greets visitors. Planting detail of the entry gardens. All these plants were added with this project. View from the living room to the pool terrace. This view is from the outdoor dining area, the project’s salvaged palm trees blend in with the palm trees on the adjacent properties. View across the reflecting pool to the lounge area and swimming pool beyond. 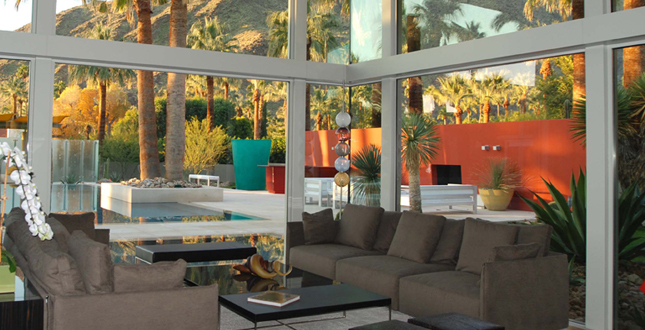 The fireplace to the west and the shade structure to the south form the edges to this outdoor room with mountain views beyond. View to the guest casita’s terrace and water feature. The room and terrace have views to the mountains, the water helps mask the street sounds beyond the hedge. 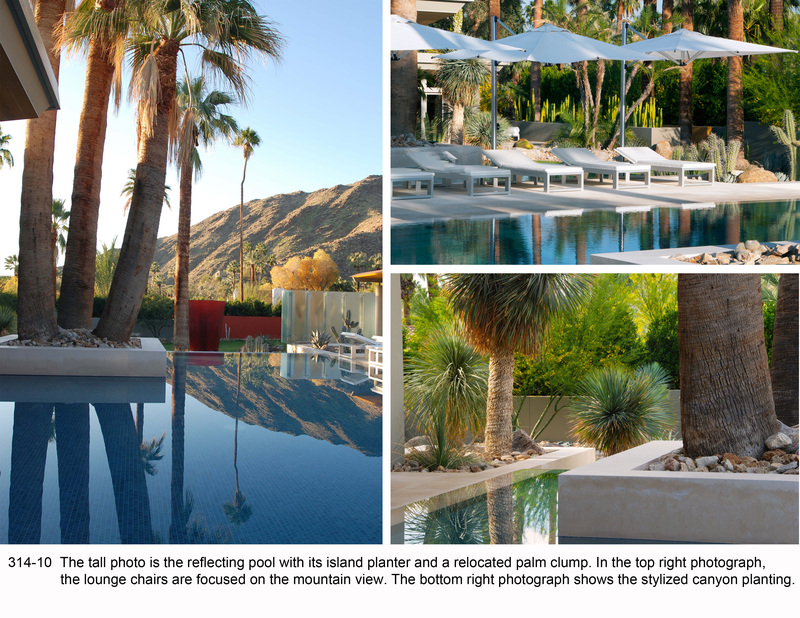 The tall photo is the reflecting pool with its island planter and a relocated palm clump. 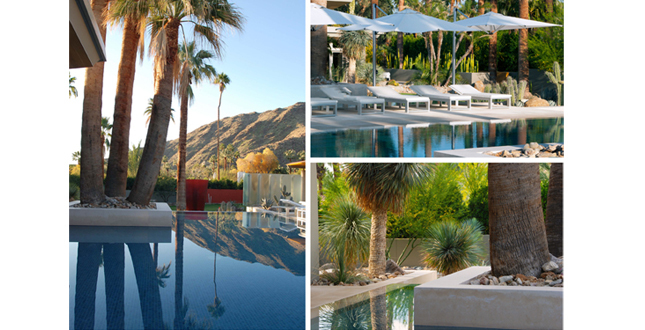 In the top right photograph, the lounge chairs are focused on the mountain view. The bottom right photograph shows the stylized canyon planting. 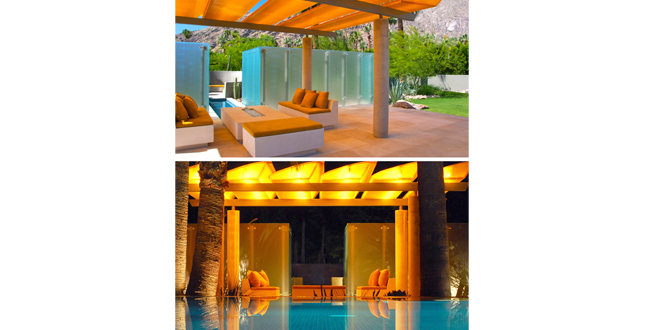 Day and night views of the fiberglass shade structure and frosted glass screen. View from the cactus garden’s fire pit. Water from the table flows towards the fire put. 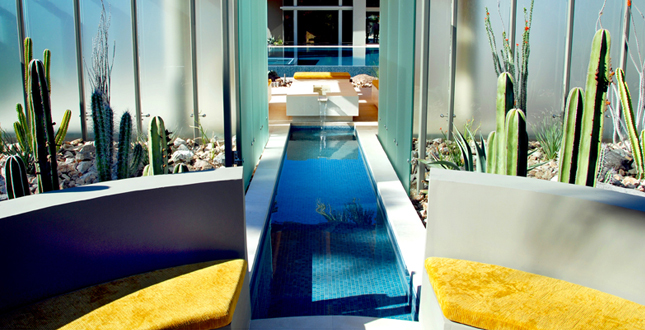 Frosted glass walls provide privacy. The translucent shade structure is beyond. The ochre ‘Domino’ wall flanks the garden at the two guest rooms of the main house. 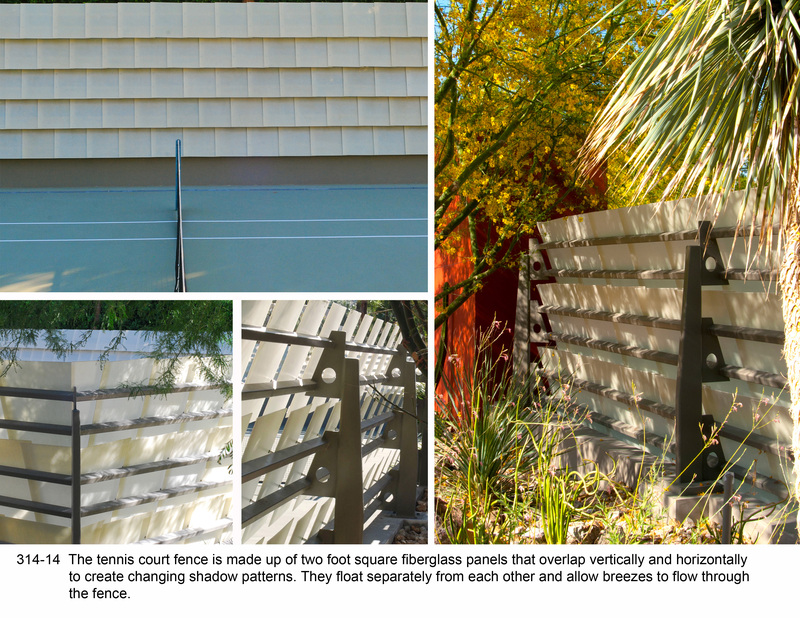 The tennis court fence is made up of two foot square fiberglass panels that overlap vertically and horizontally to create changing shadow patterns. 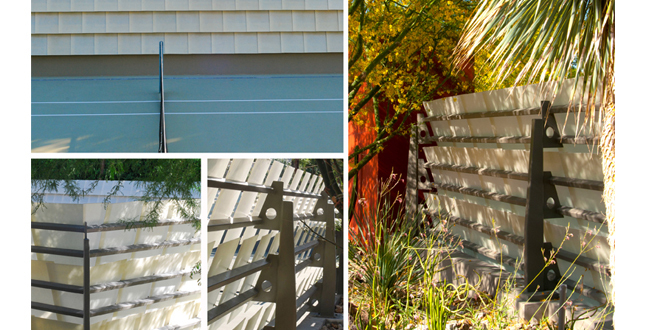 They float separately from each other and allow breezes to flow through the fence. 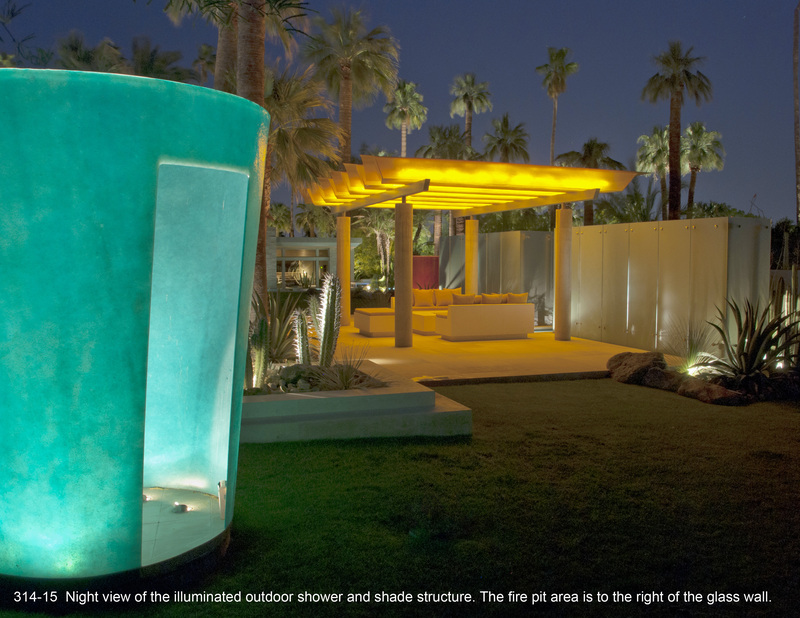 Night view of the illuminated outdoor shower and shade structure. The firepit area to the right of the glass wall. 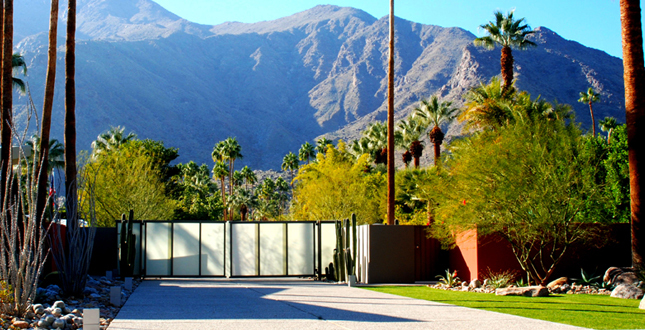 This is a new house and garden is built on 1–1/2 acres in the chic Old Las Palmas neighborhood in Palm Springs. The project was the second collaboration for the owner and the landscape architect who had developed a productive working relationship on a previous remodel of a mid-century-modern house. 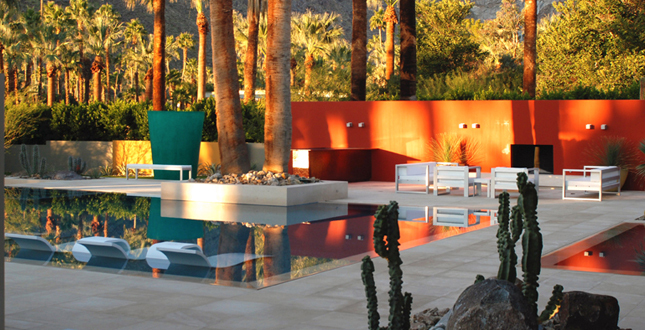 The client expected the highest level of design and also expected the project to raise the bar for outdoor living and desert style. 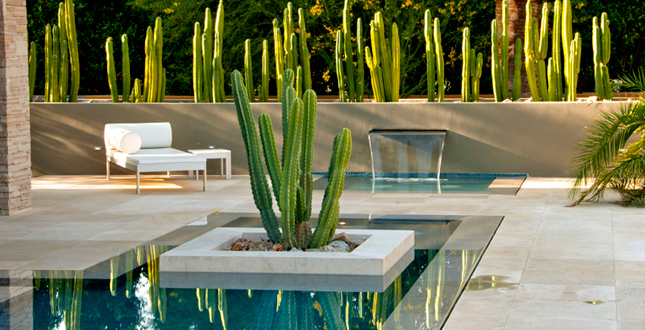 This desert house and garden’s two themes are water and light. 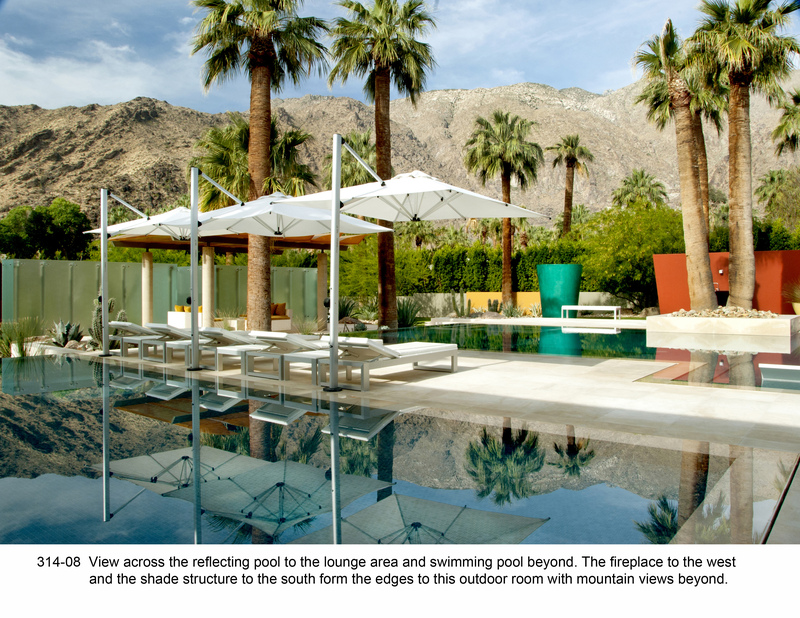 The main outdoor space has dramatic views of the San Jacinto Mountains as its backdrop. 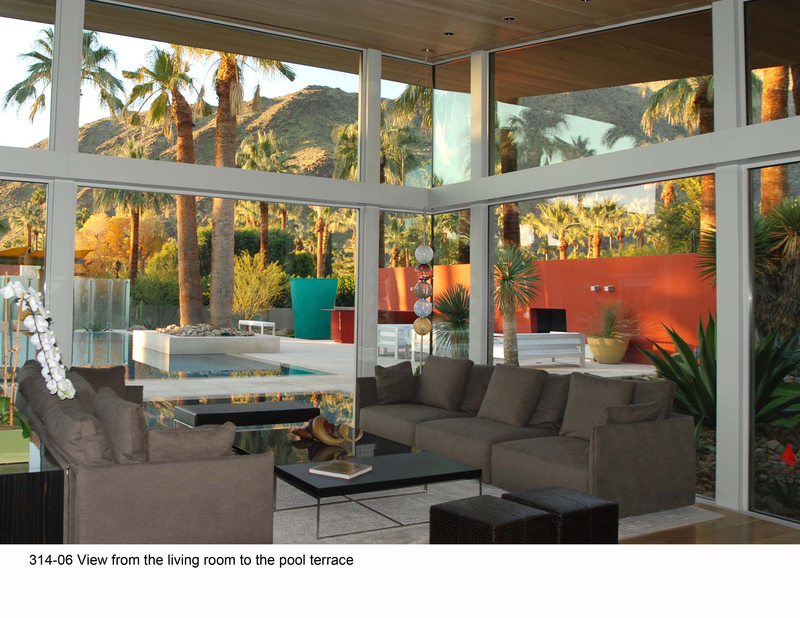 Space seamlessly flows from one area to the next and the pocketed sliding glass doors reinforce the indoor-outdoor connection. Every room in the house opens to an adjacent garden. The gardens set a dramatic focal point from all spaces in the house. Depending on the room, the garden view changes from intimate to dramatic. A house in this exclusive neighborhood typically turns its back on the street by surrounding the site with a tall hedge at the property line that is only broken by tall driveway gates into the property. 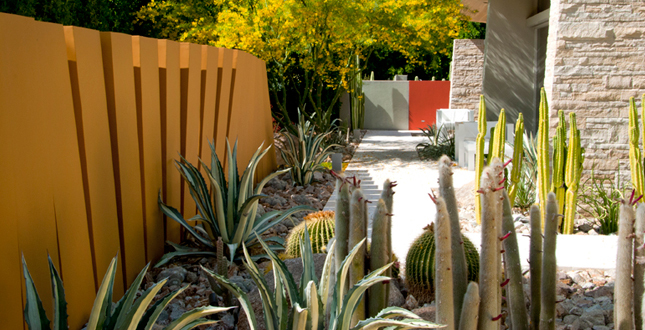 The landscape architect wanted the garden to make a contribution to the streetscape and serve as a demonstration garden that showcased desert plants to the public rather than have the garden totally hidden behind the walls. 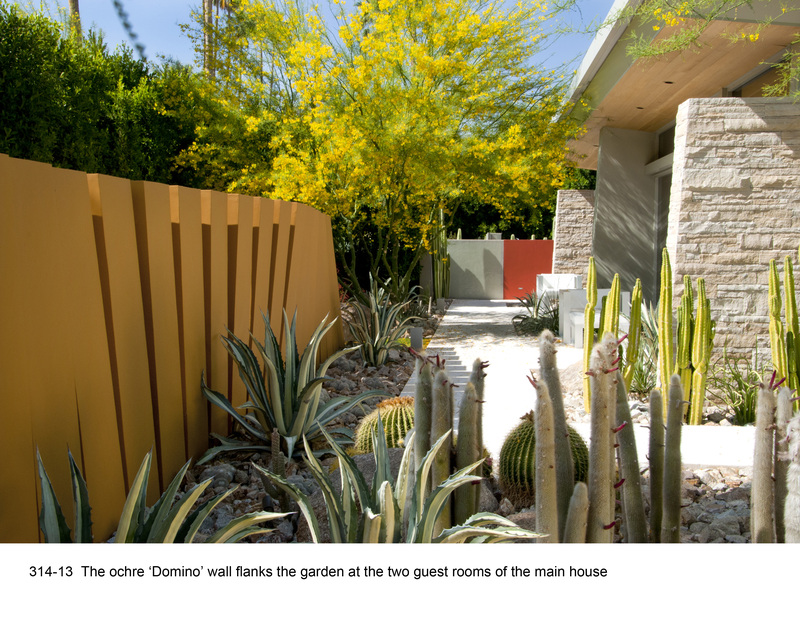 To create an entry garden, the entry gates were set back 44feet from the curb, atypical for this neighborhood. 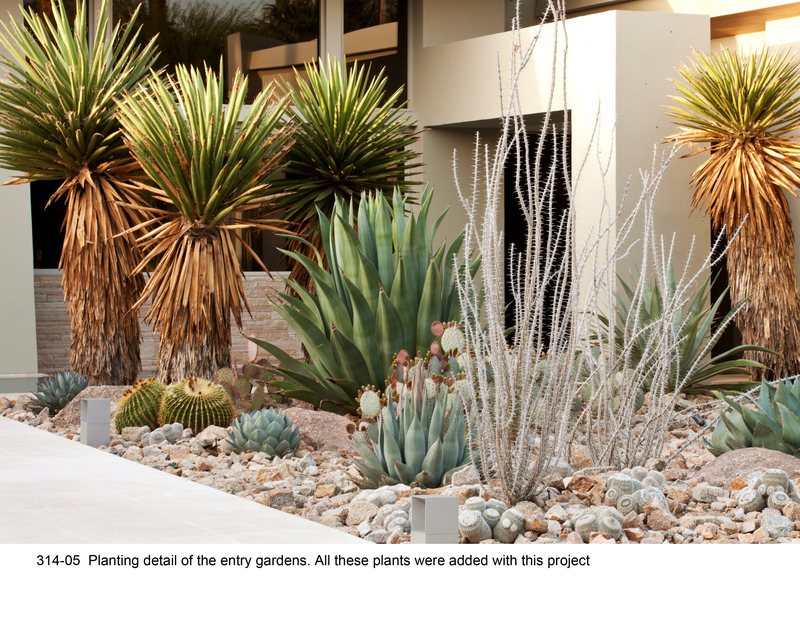 Pedestrian walks were offset on both sides of the drive to create an 85 foot wide by 44 foot deep entry garden that showcased desert plants. The client entertained regularly and used the house for fundraising functions. 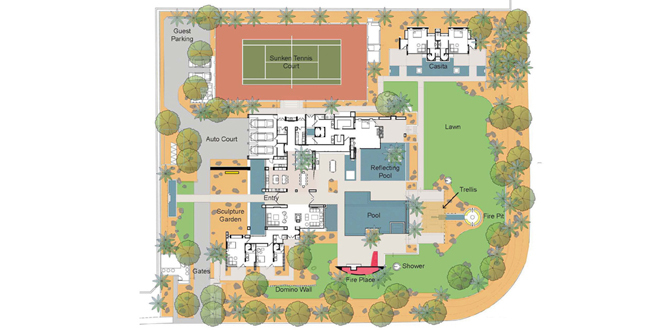 He requested generous outdoor space, a distinctive pool and water features, a function lawn, an intimate fire pit area, a tennis court that would double as an outdoor dining and event area, and an outdoor shower. 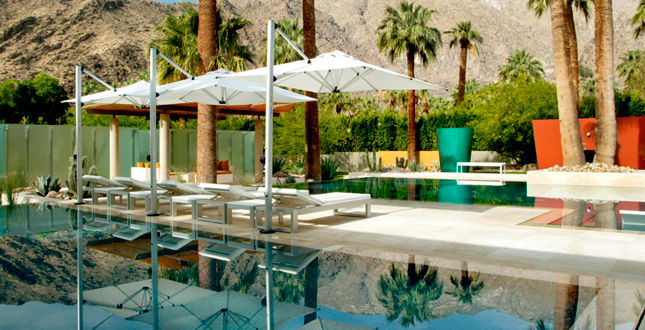 Palm Springs with its ample water supply has been long known for its culture of lawn and golf courses. 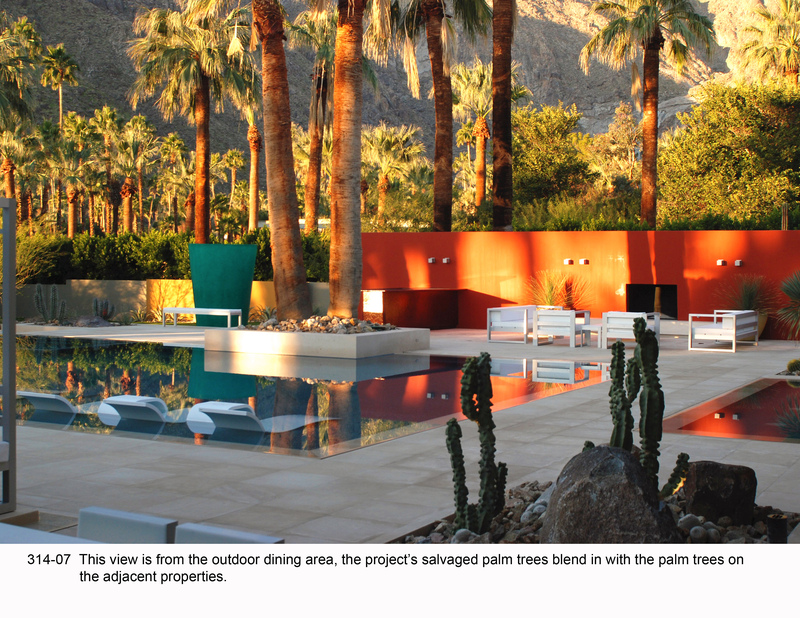 The landscape architect found this context challenging as he wanted this project to relate to the nearby desert canyons rather than the golf courses and yet crucially retain some of the unmistakable Palm Springs traditional landscape character. 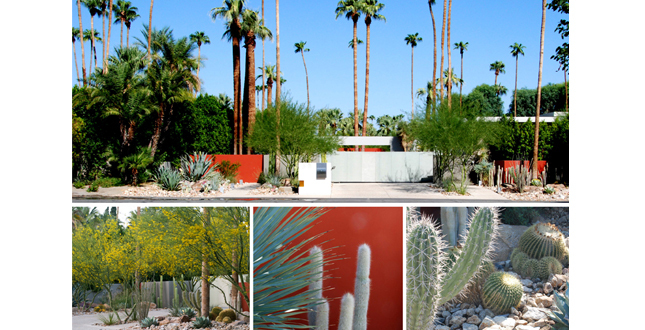 This project became a demonstration garden to showcase the spectacular beauty of desert plants. It is not a naturalistic garden but rather a dramatic and theatrical desert garden that was unlike any other garden in town. 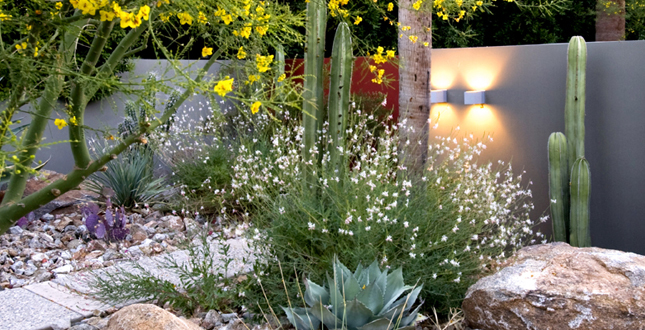 It was the landscape architect’s hope to create a buzz and interest in using desert plants as a ‘sought-after’ landscape look. 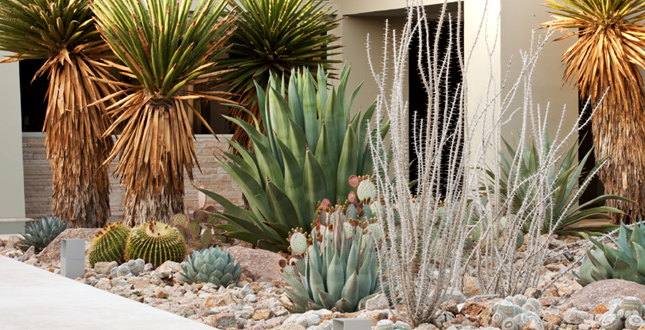 The designer showcased ordinary desert plants by creating scenes to draw attention to their dramatic form. The lot had 5 feet of cross slope and the house and pool were to be on one level. The landscape architect sited the house and designed the entire site from the doors to the property line. 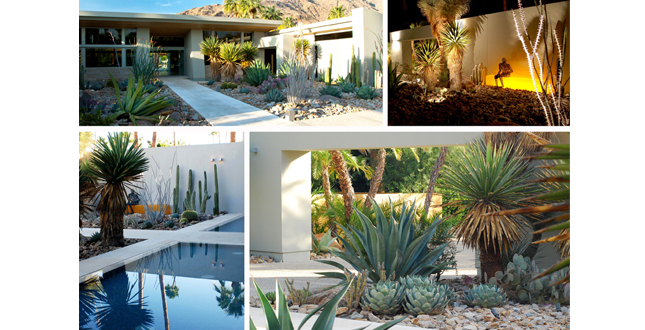 He reused all of the 92 existing palms on the property into the new design, several of which were 65 feet tall. The house and pool terrace were five feet above the adjacent street on this corner lot and the existing five foot high pool security fence provided no privacy from the street. To provide privacy while a protective hedge grew, the landscape architect devised screening elements at the pool level. The outdoor nine foot high fireplace wall is privacy screen to the street; it forms the west edge to the pool terrace and doubles as a storage shed. The frosted glass screen behind the trellis provides privacy and hides the view to the intersection beyond. It puts a ‘south’ edge to the terrace and completes the space formed by the L-shaped house and the fireplace wall. Glass panels are used like projection screens to catch moving shadows, both day and night when back lit by the sun and low voltage lights. 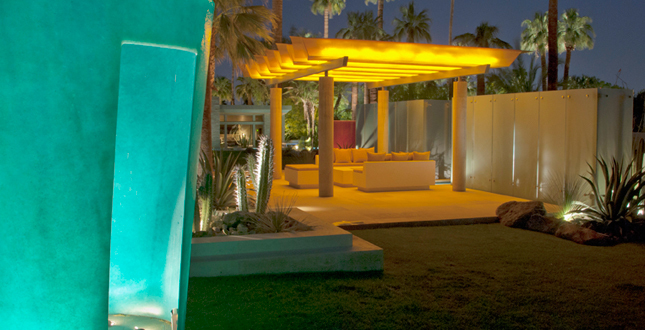 The illuminated fiberglass elements are major design features of the garden and double as sculptural light fixtures at night. The shade structure’s roof is internally lit as well as the bar-counter. 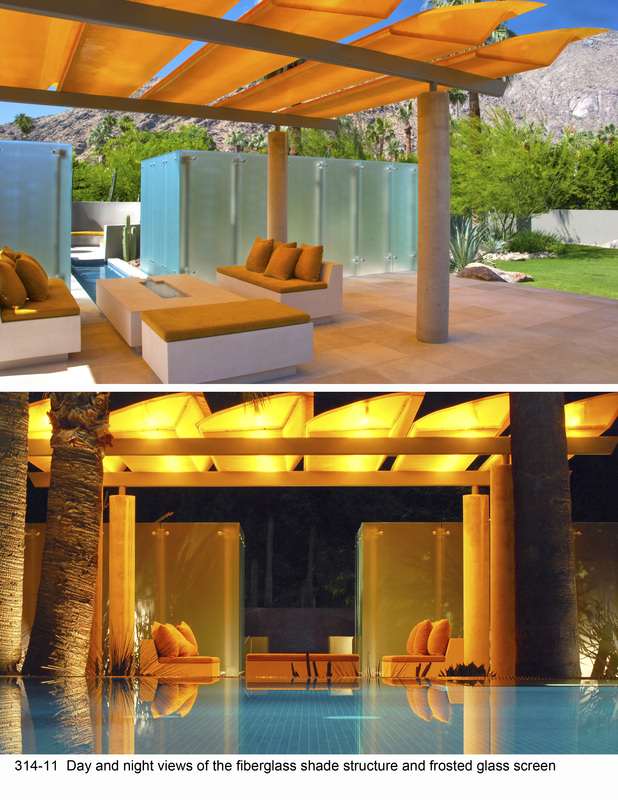 Utilitarian objects such as the outdoor shower become translucent sculptures in the garden. The illuminated sculpture bench at the entry is the focus of the entry courtyard. 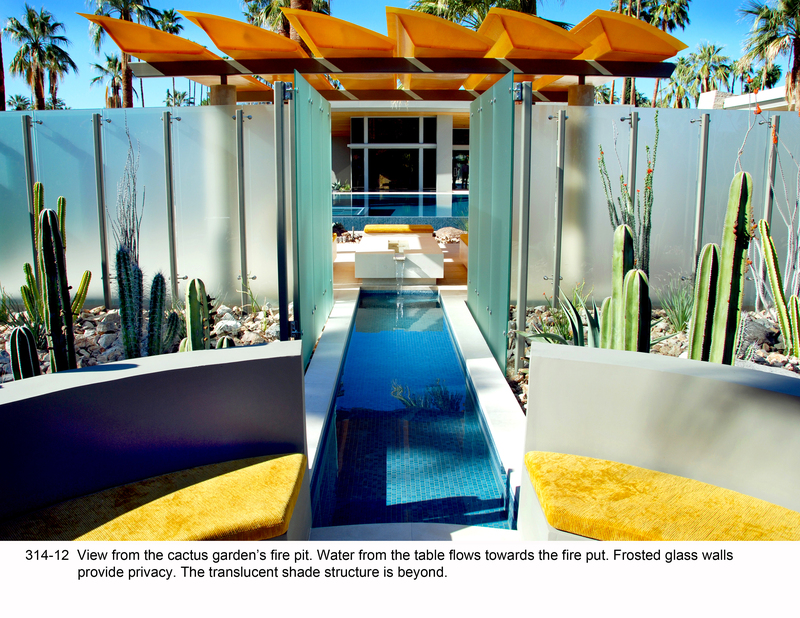 The intimate fire pit area is set in the Cactus Garden behind the shade structure’s glass walls, yet it is connected to the pool terrace by the view down the water channel. The limestone table under the trellis has a water slot to cool wine bottles. This detail was influenced by the ‘Cardinal’s Garden’ in the Italian ‘Villa Lante’ garden. The demanding client’s collaboration with the landscape architect pushed the design process to an impressive level. 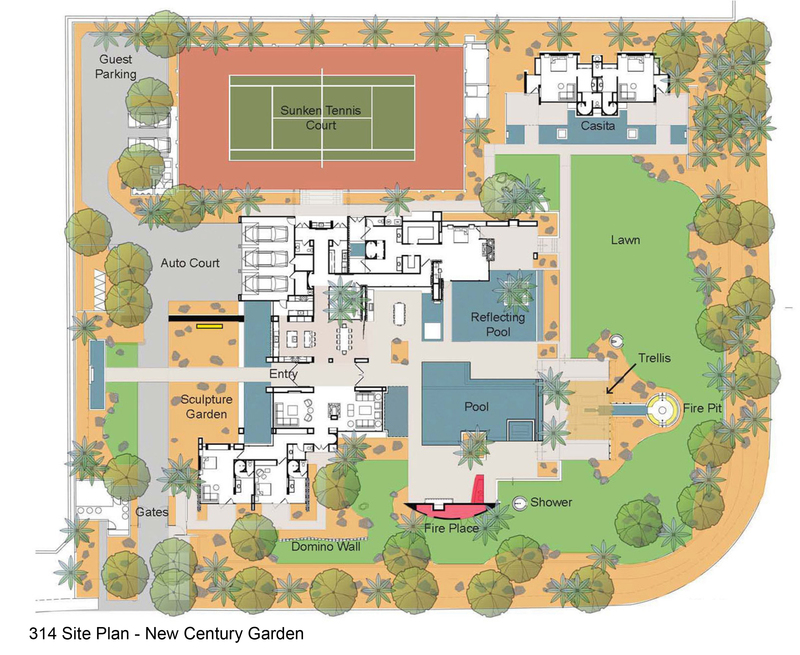 The New Century Garden is exceptional in all aspects of design and detail. The landscape architect had a hands-on approach to designing all the custom elements. He took them from concept sketches, to models, to mock-ups, to fabrications, to crating and shipping through installation. A secondary project goal was to positively influence attitudes towards the native landscape which has been pretty much dismissed and replaced with lawns and exotic plants in this area. 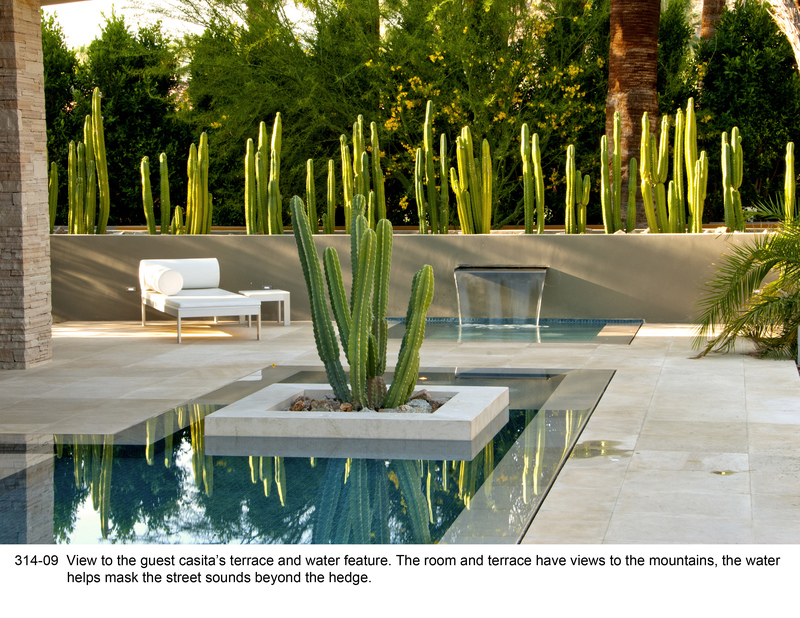 By demonstration, the landscape architect hoped to show that relating the near-by rugged canyon and desert environment is much more dramatic and desirable than the existing landscape customs. The significance of this project is to demonstrate that high design projects can utilize native plants to create dramatic landscapes that take their cues from the region while at the same time elevating the public perception of the level of landscape architects’ design skills and abilities.